As entrepreneurs we’re told to understand our why. What is the driving force behind what we do? The idea is that once we truly understand our “Why”, then we can tap into the inspiration necessary to propel us to success. “What is your Why?” is asked so often that it seems to be the new buzz phrase and, like any buzz, it eventually looses its impact. Hence this post – is it about your WHY? Well, yes and no. It’s about inspired action. Inspired products. Inspired results. Which, all have their roots in purpose. You may have heard of purposeful marketing, which starts with the why of your company; what do you (your company) stand for. Purposeful marketing identifies what you believe and clearly states it, then moves on to how this belief can benefit others and finally, it shows up as either your product or service. Effective marketing, particularly in today’s socially conscious marketplace, has shifted from a list of features and specials to a purpose driven message. Gone are the days of pitches and slashed pricing, it’s an old model and frankly feels salesy. So what does your “Why” have to do with this. When you understand and can clearly state why you are doing what you do, you’ll have a much easier time securing clients and building your business, simply because you’ll have clearer understanding as to your ideal market. People don’t buy what we do they buy why we do it. It’s the reason why some businesses thrive and others flounder. The Why carries over to your customers by delivering a specific end result. A result that speaks to the subconscious by triggering an emotional response, which goes back to people buying the why not the what. People buy the feeling, or experience they’ll have as a result of using your product or service, not the list of features. It’s what those features can provide for them, not the features that should be the focus. The focus is on the specific end result, why are you doing what you do? To help people live a healthy balanced lifestyle. How does this show up for your customers? In a specific result they will experience by working with you. By focusing on the ultimate deliverable of your business you automatically hit an emotional trigger that is relatable. While this statement is somewhat specific, it doesn’t paint a picture as vividly as the first example. It’s harder for the mind to envision loosing 10 pounds, especially if you’ve ever had difficulty loosing weight and keeping it off, your mind is more likely to say that’s crap I’ve tried that before. Whereas the first example gives a much more specific result and a clearer, almost tangible picture that the subconscious has an easier time accepting. 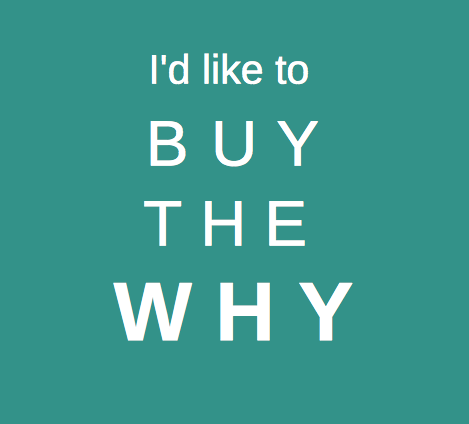 People buy the why not the what! Which statement creates a better visual, one which your mind can get excited about? Even if we change out the number, the second statement doesn’t hit an emotional touchpoint because it doesn’t paint the picture. If your ideal client hasn’t ever done more than 100k in sales it will be difficult to get her to believe she can do 500k. And conversely, if she has done 500k, you’ll clearly be missing the mark with statement like this. Better to focus on the motivator, why is the sales training beneficial, what result does it provide and why does it benefit your client? Remember people don’t buy the what, they buy the why; the reason behind the what! So yes, your why is important as it gives clarity to your goals. Without clear, specific goals you’ll have a hard time staying focused long enough to move your business forward. When you’re ready to take your business to a higher level, or need support along the way join our free FB group: theHUBlineCommunity, where you can connect with likeminded entrepreneurs and gain valuable tips, strategies and resources to help you build a thriving business online.